Olguin’s is a three-generation family business. Besides great customer service, what is the secret for your success? I believe the secret to our success is hard work, determination and endurance. We work outside the box and we have had to become more creative with our products by expanding and teaching ourselves new traits about furniture and woodworking. We also offer new products such as a kiln, and other methods to utilize the limited resources we are able to obtain. It all depends. Our vigas, for example, have a great reputation and our beams are always in demand, but it all depends on what phase of building the people are in. Taos usually has a seasonal building period. Spring brings a demand in fencing material like railroad ties, cedar posts and latillas. Late spring calls for framing material and materials for raised beds that will be used in gardening and landscaping. In the late fall, firewood is in great demand. But definitely our vigas, beams, corbels and decorative posts (in other words, our Southwest style materials) are always popular. Indeed, vigas and latillas can add an instant touch of warmth to any house. How can exposed vigas be protected from sun damage? To help preserve exposed vigas the only recommendation is to apply a good quality UV protectant. That fact that it is a family business. We love working together as a family. To top it off, we get to work with nature. We are able to see on a daily basis the Southwest beauty of our products. We are able to harvest what God gave us in this world and turn it into a different type of beauty. And that is not just us! Every home owner and contractor can look at it with great pride and satisfaction. It is a piece of nature polished. Could you describe a specific project of which you are particularly proud of? Oh, there are a number of them. We get such a variety of projects that are so unique and stand out… I will name a few that you might be familiar with. The Denver Zoo: we supplied materials to the ape habitat and other small areas of the Zoo. We supply materials for the Texas Land and Cattle restaurants here in the Southwest and also in the Mid West. We supplied the US Forest Service the materials to restore or rebuild the Shuree Lodge in the Valle Vidal. We were able to supply the vigas and majestic corbels for the new courthouse and administration building here in Taos. On West Highway 64, toward Chama, there is a magnificent barn constructed from our material. The Ski Valley, as well as many homes in Taos, has used our materials to give their homes and structures the awesome Southwest look that is intriguing to all who see it. This look is taken from Taos to areas as far as California, Texas Virginia, Canada, Louisiana and many places in between. But the one we most enjoy and are proud of is, of course, our home. 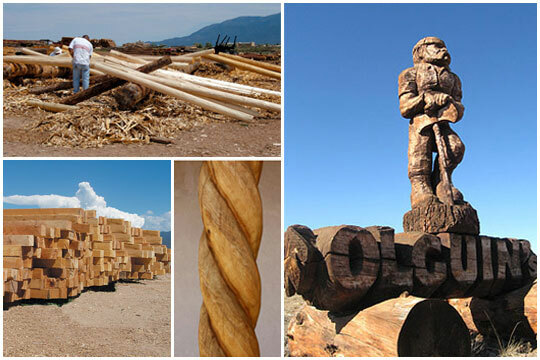 What makes Olguin’s a unique sawmill? The Southwest has a unique building style and we are one of the few left that caters to that style. Most of our raw materials are harvested in an environmentally friendly manner and are also locally harvested and processed. We do custom cuts and are able to provide materials to the creative and the artist in people. We try to do it the way our customer wants it done. Customer service is important to us. Though it seems in many areas to be a dying trait, we work hard to keep it alive here. What is the best thing about working in Taos? The people are great! And as mentioned before, they are so creative. We have such a diverse group of people living in Taos… that definitely makes it interesting. But the beauty of Taos does go beyond the people. We are blessed with the view of a magnificent Taos Mountain that wakes up with us each morning and talks and walks with us through out the day. Our four seasons are awesome. They always give us something to look forward to. Do you have any specials now? We have regulars that take advantage of our annual firewood special. It usually takes place from the 15th of March to the 15th of April. We sell our mixed firewood for $150.00 a cord, with a minimum of two cords delivered. Do you donate any kind of services to community organizations or charities? We try to be members of our community by giving back. We are strong believers in education and in kids in general. We give educational tours to classrooms. We also supply materials to vocational classrooms. We strongly support our 4H youth. 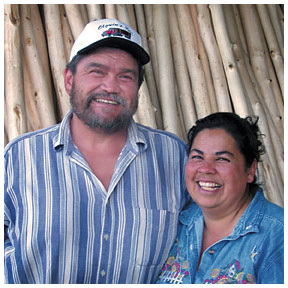 We, Dan and Della Barrone, as individuals, are engaged in multiple non-profit organizations. As a result, many members of the community have benefited in different ways from Olguin’s, mainly through donations and sponsorships. Previous Post ¡Somos taoseños!/ We are taoseños!